SORRENTO Sharks have survived an almighty scare courtesy of Mt Eliza, but held on to claim all four points in their top of the ladder clash at Emil Madsen Reserve. Mt Eliza were fighting for the top position on the ladder, and had their chances boosted by the absence of Sorrento forward Chris Dawes. In wet conditions, Mt Eliza raced out of the gates to establish an early lead over Sorrento, going into the quarter time break with a 14 point lead. 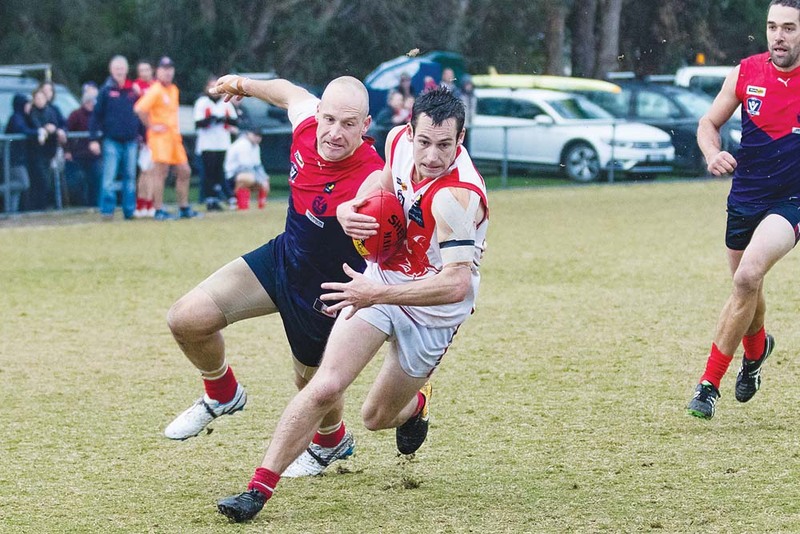 The Redlegs were well on top throughout the day, applying more tackles and playing more direct football, which proved to be a smart tactic in the wet weather. Going into three-quarter time, Mt Eliza were comfortably 16 points ahead, and Sorrento looked dead and buried. After the final break, Sorrento’s Hallahan brothers came alive in stunning fashion, combining to quickly put a few goals on the board and inject some life into the contest. Mt Eliza were stunned by the way Sorrento played in the final term, with the Sharks dominating centre clearances and showing the class of a premiership team. The Sharks quickly established a lead, and Mt Eliza could do nothing to stop the onslaught of goals. The final quarter ended up being a six goal to one blitz, and Sorrento eventually ran over the top of Mt Eliza in a 10.10 (70) to 13.7 (85) win. Leigh Poholke continued his good run of form with five goals for Sorrento, all scored at important moments when the game was hanging in the balance. The win puts Sorrento two games clear of Mt Eliza at the top of the ladder. One of Sorrento’s best was playing coach Luke Tapscott, who made his return from injury on Saturday. Tapscott said that while it was good to get the win, there was still plenty of work to do. “We were happy with the four points, but we got away with playing one quarter of footy,” he said. Sorrento will travel to play Rosebud next Saturday. At John Coburn Oval, Frankston YCW were looking to break their four game losing run against last place Seaford. Both sides struggled to adapt to the conditions in the first term, with neither side putting a goal on the scoreboard by the first break of play. In the second term Sorrento made a breakthrough and kicked the first goal of the game, but unfortunately the game came to a sudden stop before either side could kick another. An injury to Frankston YCW’s Luke Paynter required an ambulance to be called, and the game was abandoned before half time. The league has ruled that because there had been less than a half of football played, both teams would share the points. At Greg Beck Oval, the Frankston Bombers hosted a Mornington side that has been in impressive form. The contest looked one sided right from the first bounce, as the Bombers put the injury depleted Bulldogs to the sword with a dominant five goals to zero first quarter. Frankston Bombers continued to pile on the misery in the second quarter, and went into half time with a 41 point lead. Although Mornington were able to restore some respectability with a valiant second half showing, they went down to an impressive Bombers outfit 16.10 (106) to 9.6 (62). Samuel Fox booted five goals for Frankston, while Jason Kingsbury kicked three and was among the best players on the field. In Saturday’s final clash, Bonbeach took on Rosebud at Rosebud Recreation Reserve. Both sides looked evenly matched throughout the contest, with the lead only standing at one point in Rosebud’s favour at the three-quarter time break. Rosebud ran over the top of Bonbeach in the final quarter, registering nine scoring shots to three in a completely one sided showing. With a dominant final term, Rosebud secured their third win for the season running out 8.11 (59) to 10.11 (71) winners. Thomas Stoffels was again among the best for Rosebud, scoring a game high three goals to help his side to victory.